Our Renault radio codes are available 24 hours a day 7 days a week. We guarantee our radio decodes work, and its totally FREE! 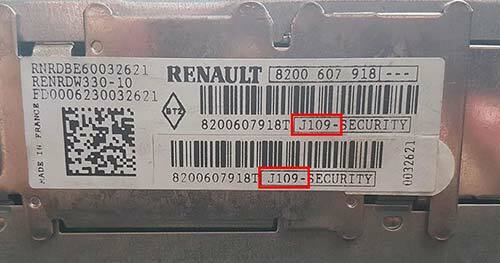 How to Find Your Renault Radio Code Serial Number. It is quite simple to remove your Renault radio. You will need a set of radio release keys (PC5-83). These are inexpensive and are around £3 – £5, you can obtain them from a local car audio shop or Halfords. The Renault radio serial is a letter followed by 3 digits for example N123. This is sometimes called the Security Code. This may be part of a larger serial/barcode number starting with 8200/7700/2811. An example of this would be 8200607918TJ109. Please see images below for reference.